Trying to find an apartment over these past few weeks has been pretty frustrating. Really frustrating. So frustrating I’ve developed a sort of tick in my left eye. It’s not very attractive. I’ve been trying to put my finger on why this apartment search is infinitely more tiring than all of the other times I’ve looked for apartments (in four other states and two countries, no less)…and I think it comes down to control. Tenants do not appear to have any control in the apartment rental process in Switzerland. I’ve been turned down for apartments where the owner recommended me as their #1 choice. I’ve been told that an apartment is going to sit vacant for a few months instead of being rented out. I’ve had tenants tell me that they could not get approval to move out of their own apartment, therefore we couldn’t move in. Does the phrase “tenants’ rights” even exist in Schweizerdeutsch? So yesterday I took back some control. 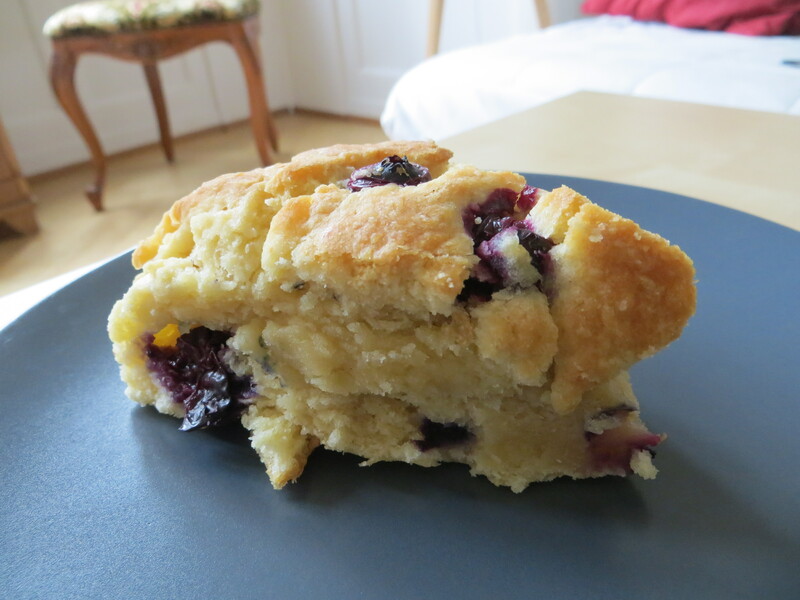 OK, I baked blueberry scones…but it felt like control. I made a plan. I executed it. I ate it. It was the most satisfying thing I’ve done in weeks. I’d highly recommend it as a form of therapy. Preheat the oven to 400 degrees Fahrenheit. Ready a flat baking sheet by either putting down parchment paper, a silicone baking mat or lightly greasing. I also put the butter in the freezer for a few minutes before I begin baking to ensure that it is very cold. Meanwhile, sift together flour, sugar, salt and baking powder in a bowl. Cut in the cold butter using a pastry cutter or by running two knives across the mixture over and over until the mixture is in crumbly pieces. The largest pieces should be about pea-sized. Gently mix in the blueberries. In another bowl, whisk together the cream and eggs. Make a small well in the bowl of dry ingredients and pour in the wet ingredients. Using a fork, gently mix together the ingredients. Turn the mixture out on a floured cutting board or piece of parchment paper. Gently pat together the dough and knead until it forms a ball. 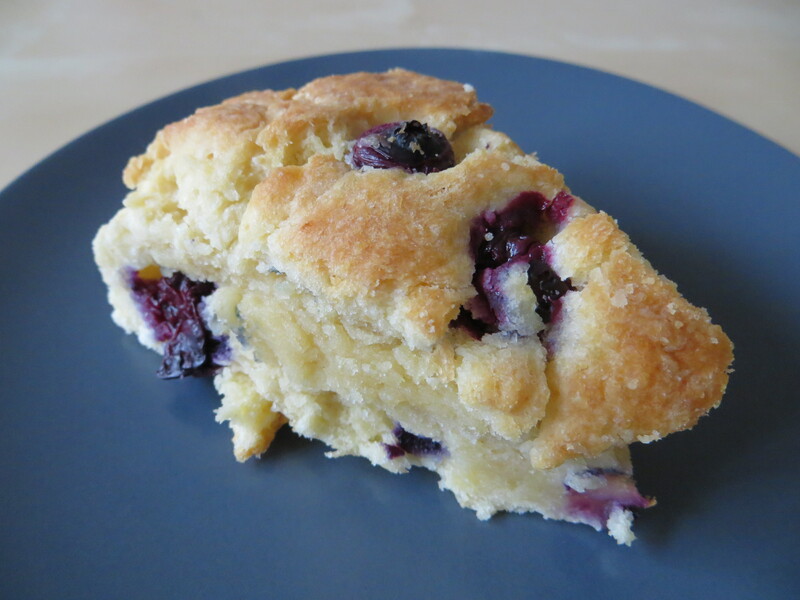 It is important not to overwork the dough–it should still be a bit shaggy. Transfer the ball to the baking sheet. Flatten the ball into a circle about two inches thick. Using a wet knife blade, cut diagonally across the dough circle into eight wedges. Don’t pull the wedges apart, just cut through.